ItemHalifax Power & Pulp Co. mill, Sheet Hbr. Halifax Power & Pulp Co. mill, Sheet Hbr. The groundwood pulp mill was built in 1924 by the American Perforated Wrapping (A.P.W.) Company of Albany, New York. 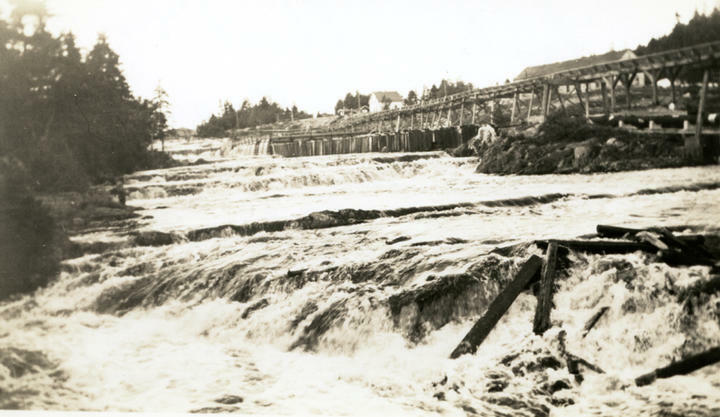 The mill was located at the mouth of the West River in Sheet Harbour, Nova Scotia, and its first pulp produced in March of 1925. The first shipment of pulp took place in June 1925, marking the first ocean-going ship to reach Albany, New York, and establishing it as an Atlantic seaport. In 1933 the company’s name was changed to Halifax Power & Pulp Company, and controlled by Roger Babson interests. It was subsequently sold to Fox Brothers in 1944, and Hearst Enterprises of New York in 1946, but both times the company name was retained. In 1963 the company was sold to the Fraser Companies, Limited of New Brunswick, and became known as Fraser Companies, Limited, Nova Scotia Division. Finally in 1964 it was sold to the Scott Paper Company of Philadelphia, Pennsylvania, and became known as the Scott Paper Company, Sheet Harbour Division. Throughout these changes the operation in Sheet Harbour was helmed by J.S. Donaldson, and after 1967 by C.B. McKenna (supplied by Dalhousie University Archives). This image shows the trestle work which carried a flume for two foot logs up over the mill roof to the wood bins, which are the twin rectangular structures on the roof in front of the taller roof section (supplied by John Woods).